Does President P.L. Harned sound familiar? It didn’t ring any bells for me either, but he was, for a very short time, this University’s second presdient. Apparently, when our first president, Professor R.L. Jones, supported the wrong person in a heated governor’s race in 1918, Jones’s resignation helped avoid damaging the Normal School. Perry L. Harned, from Montgomery County and a member of the State Board of Education, was elected to replace Jones. However, nobody checked with Andrew L. Todd, the Murfreesboro attorney who influenced virtually everything about the beginnings of the Normal. His control continued as he sought to prevent a political rival from heading “his” school. he encouraged a local citizens’ group to join the fray, and they selected their own candidate-P.A. Lyon, dean and mathematics professor at the Normal. Whatever attraction moving to Rutherford County held for Harned vanished, and he immediately resigned. Lyon was named acting president. Just two years later, the political winds shifted, and Alf Taylor was elected governor, clearing the way for Jones to become president again, a position he held until 1921, when he left to become superintendent of schools in Memphis. Not surprisingly, politics played just as relevant a role -maybe more so- almost 100 years ago as it does today! That is but one of myriad surprising historical nuggets I found while rummaging through University materials in preparation for a book chronicling MTSU’s first 10 decades. (And I thought I knew all about MTSU. After all, I’ve been writing about it for more than thirty years -along with editing the words of others!) In case the Centennial has snuck up on you, Middle Tennessee State Normal School, MTSU’s predecessor, opened its doors on Monday, Sept. 11, 1911, and plans are well under way for celebrating our 100-year mark. Though it perhaps shouldn’t have been a surprise, I was struck by how very different the decades are. What was socially and morally acceptable at one time often is very jarring to us today. For example, in the January 1922 issue of The Normalite, a student publication, a writer describes the editorial contribution box as “about as popular as a ham sandwich” at a picnic of a specific ethnic group that avoids consuming pork. Sitting in the quiet confines of Walker Library Special Collections reading room, I gasped audibly. That really brought home to me how different the world was then. Still another startling difference is seeing colorful Lucky Strike cigarette ads and other tobacco-related promotions adorning covers and center spreads of football programs from the early and mid-1900s. More interesting as a confirmation of history than as revelation -married female students were identified through their husbands. In a listing of early graduates, “Mrs. Hugh Burrum” fairly jumps of the page. Though it’s commonly accepted that track began with Coach Joe Black Hayes in 1955, alumnus Winifred Lewis McFerrin telephoned with what really happened. He said that in 1948, “Coach Bubber Murphy called several of the athletes [from various sports] together and told us the athletic department had allocated a small amount of money for track and field.” Murphy asked Lomas Moffett, who was older than the others, to be in charge. McFerrin says they traveled to meets but could only compete in events for which they had a qualified participant. 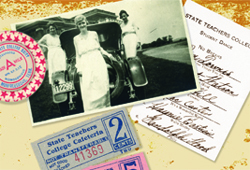 A newspaper clipping found in a scrapbook housed in the Alumni Office confirmed his story. McFerrin, 83 and retired, is a WWII veteran who attended on the GI Bill and was a basketball walk-on. Researching MTSU’s rich history has made me wish that time travel were real; I long to talk with Charles Joseph Woodson, a slightly built player on the 1923 basketball team. His patched, woolen uniform is stored at Kennon Sports Hall of Fame. And when I’m at the Gore Research Center reading letters from early faculty members, I long to have a face-to-face conversation instead. But though we may not be able to travel in time, we can travel through pages of photographs and words. To that end, I invite you to join me in meeting figures from history who helped create traditions of excellence. The Centennial Book will be available for purchase later this year. Information can be found online at www.mtsu.edu/centennial. Middle Tennessee State University was founded on Sept. 11, 1911, and is the oldest and largest university in the Tennessee Board of Regents System. 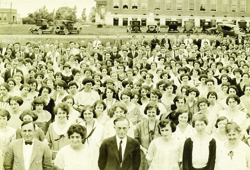 During 2011-12, the University is having a yearlong observance and celebration of our founding. The celebration includes a Centennial website (www.mtsu.edu/centennial) featuring a history timeline for viewers to revisit dates throughout the decades. It also includes a Centennial Facebook page. Alumni and friends of MTSU are encouraged to visit any or all of these sites for new content, new announcements of upcoming events, and even a digital clock counting down the days, hours, and minutes to the Blue Tie GAla, which will kick off the celebration on Sept. 9, 2011. Alumni and friends are invited to post or send photographs or messages concerning their MTSU days to be included on one of the Centennial sites. During 2011, MTSU will also establish the Centennial Scholars program, which along with the existing Buchanan Fellows and Presidential Scholar programs, will offer MTSU students three of the most competitive scholarships in the region. If you have questions about the University’s Centennial Celebration, please contact us at centennial@mtsu.edu.